Markets are higher this morning as commodities continue to rebound. Bonds and MBS are down. Import Prices fell 0.1% in September and are down almost 11% on a year-over-year basis. Wholesale inventories rose 0.1% in August, while wholesale sales fell 1%. Both numbers were worse than expectations. 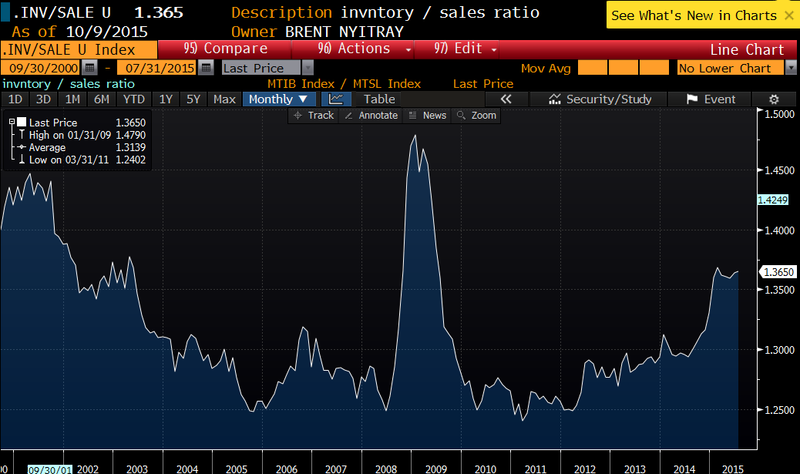 The increase in the inventory to sales ratio is a worrisome sign., You typically see the ratio build ahead of a cyclical recession. The FOMC minutes confirmed what everyone suspected – that international worries prompted the Fed to hold interest rates steady at the September FOMC meeting. Overall, the Committee seemed rather constructive on the US economy in general. The Fed Funds futures are currently handicapping a 10% probability of a hike at the October meeting and something like 40% in December. Note that while the Fed is sanguine on the US economy, economists are generally more cautious. A survey of strategists and economists puts the chance of a US recession at 15% over the next 12 months. It is important to note that the Fed’s forecasts for economic growth have been consistently high since the Great Recession. Representative Kevin McCarthy withdrew his name from consideration for the next House speaker after allegations of an affair ended up on a Wikipedia page. This leaves current speaker John Boehner in charge for the time being. Interestingly, the Wikipedia edit emanated from the US government itself – someone in the Department of Homeland Security. After the Secret Service started distributing confidential information on Representative Chaffetz, it looks like the worker bees in the government are going directly after Republican politicians. It will be interesting to see if anyone in the Obama administration actually cares. Hillary’s plan for the financial system. A surtax on banks with over $50 billion in assets, an increase in the statute of limitations for financial crimes, and toughening the Volcker rule regarding proprietary trading. Note that margin debt is falling on the stock exchanges. This could be a reaction to the turmoil in overseas markets. Generally speaking margin selling tends to exacerbate downward moves, so having less margin debt is actually a good thing. The share of foreign homebuyers is at an 8 year low in California. I don’t know whether or not Carson knows what the debt limit is, primarily because Ryssdal’s interview makes it anything but clear, as Carson evades a direct answer to the false dilemma being posed to him. What is clear, however, is that if indeed Carson “literally” does not know what the debt ceiling is, he shares that ignorance in common with both Rysdall and Chait. The debt limit is a routine vote that Congress must periodically make to authorize payment on debts the government has incurred. Absolutely, 100% incorrect. The debt limit in no way whatsoever authorizes payments on debts the government has incurred. It authorizes the the government to incur debt in the first place. The Constitution itself, in Article I section 8, authorizes payments on debt the government has incurred. It has no impact on the budget, but the failure to lift the debt ceiling means the U.S. government would go into default, a potentially disastrous event. Again, absolutely 100% incorrect. As I have pointed out here before, failure to raise the debt ceiling would not in any way force the government into default. New debt can always be issued to cover principal payments on maturing debt without increasing the size of the debt, and therefore can always be done within existing limits. And monthly interest payments on the current debt amount to just about 1/10th of monthly tax revenues collected by the government, so the interest payments can always be covered by revenues. Failure to lift the debt ceiling absolutely does not mean the US government would go into default. As you know, Treasury Secretary Lew has come out in the last couple of days and said, “We’re gonna run out of money, we’re gonna run out of borrowing authority, on the fifth of November.” Should the Congress then and the president not raise the debt limit? Should we default on our debt? To be clear, it’s increasing the debt limit, not the budget, but I want to make sure I understand you. You’d let the United States default rather than raise the debt limit. I’m gonna try one more time, sir. This is debt that’s already obligated. Would you not favor increasing the debt limit to pay the debts already incurred? It is bad enough that Chait and Ryssdall are totally ignorant about the things they pontificate on. Far worse is the smug, self-satisfied condescension that it produces. How is that these clowns get paid for this crap? Interesting column by Francis Wilkinson. But the Ultras are not big on balance. Or, really, democracy. To them, Obama is not the duly elected president of the United States, the nation’s highest officer. He is an affront and an obstacle. Since he is not an archconservative Republican, and they so fervently wish that he were, they simply deem him illegitimate. The Ultras are called “outsider” and “anti-establishment” and “anti-government.” And they are in various ways. But they are mostly anti-democratic. They reserve their greatest contempt for compromise, even with members of their own party. Compromise is the viscous stuff that enables diverse interests to be accommodated and government to function. It’s the stuff of American pluralism and representative democracy, fluid enough to carry multiple views but still sticky enough to make one of many. The Ultras are at war with Democrats, with Republicans, with government itself. But mostly they are war with perhaps the greatest, if least heralded, of American political ideals: half-a-loafism. In a 50-50 nation, they don’t want small bites. They want it all. Never mind that they represent a rump of one party. Yet their influence is not confined to the House or even the Republican presidential primary. When Republican legislatures enact voting restrictions expressly designed to keep Democratic constituencies away from the polls, they are not primarily fighting an ideological or routinely tactical battle. They surely are not fighting phantom voter fraud. They are fighting democracy. For all you guys who are trying to say that liberals are splitting this country apart. Do you believe what the article posits? That the Tea Partiers in Congress don’t want to compromise on anything? Yes. 1) 2012 aside, complete opposition to obama has been largely a political winner. Control in the states is increasing and our rebound from what should have been a political knock-out punch (2008) has been about as good as you can hope. 2) obama is a doctrinaire liberal. The priorities of democrats are not the same priorities as republicans.. He wants a more progressive tax code. We want a flatter one. He wants more social spending. We want to defund Planned Parenthood. Immigration reform is all about turning Texas purple, so creating whole swaths of new democrat voters isn’t high on the GOP’s priority list. Aside from things like trade, I just don’t see a lot of common ground. 3) the GOP owes obama nothing. The two parties have been at war since he took over. He is simply miffed that Republicans have played outstanding defense since 2010. I think his only post 2010 legislative victory was the sequester, which was a called bluff. Most of his “compromises” were attempted cons that failed. presidents don’t get to impose their will on the country. 4) Nobody owes their party anything either. These guys don’t need party funding – they get their own. The people that put them in office see the democrats and the RINOs as more or less the same thing. I was incensed that GWB started giving out free drugs to old people. If I wanted more stuff for old people, I would vote D.
5) In the great march of liberal progress, these guys have merely been a speed bump. I fear you guys will eventually turn us into France, but I will probably be dead by then.. Honestly? Take the largest provider of health care for low income women out of business? Really???????? You know, I used to think you were just a purveyor of PP propaganda. But I am beginning to think that you are actually a victim of it. You really and truly believe this stuff, don’t you? Try to understand, Mich. The objection to Planned Parenthood isn’t that it is a provider of “women’s health”. It is that PP is a provider of abortion. The fact that the proposal to defund PP includes a proposal to take PP’s funding and give it to other women’s health providers which do not do abortions ought to make that clear. Question for you: Do you believe that PP would be forced out of business if it stopped selling abortion services? That is, do you think the money it gets from abortion subsidizes whatever else it does? It isn’t necessarily MY priority, but it is what it is. Do you think that the “Ultra’s” doing what the tea party constituents want them to do? Also, per the article, what is “political “reality”? McWing: do you think that what tea party constituents want, which is by far a minority opinion in this country, should be the law of the land? Brent: you said “we”. That’s what I was asking. It doesn’t sound like you, so I’m trying to figure out how “we” worked its way into your comment. Which Congresspeople are violating the law of the land? Also, which laws are being violated? As a Bagger, I don’t support most law violations. Some of course I do. I’m prepared to accept the consequences however. My question stands, are the Tea Party Congresspeople faithfully executing what their bagger constituents want? McWing: that wasn’t the question I asked. Correct, I did not. I misread yours. As a Bagger, I want Medicare, Medicaid and Social Security ended. I want the military budget cut by a third. I will vote for people who I think will get me closer to that. So, no, Bagger Congresspeople are not faithfully serving my desires. Will you answer my original question now? No, I do not. They aren’t putting legislation forward to end anything that you list–they’re merely blocking the administration of government. They (as far as I can see) have no agenda and no vision, they only have a goal–if you can call it that–of blocking any legislation that reaches the floor. Ending existing programs requires actual positive, in the scientific sense, action. They aren’t doing anything positive. So, now answer my question. Your views are in the minority, even among conservatives. So should they rule over the majority view? My views are, in my opinion, correct. It’s irrelevant whether anybody agree’s with me. I honestly don’t care about any moral implications of minority rule as there is no objective morality. Implementing my desires will lead to a more sustainable economic system, that’s what matters to me. You demonstrate the article’s point ably, McWing. Congratulations. And? i asked you originally if you believed what the article posits. Democrats have used similar tactics in the past – remember the ones who fled to Illinois in order to prevent a vote on public union benefits in Wisconsin? Both sides sometimes play that game. Do I feel like the Tea Partiers are representing the wishes of their constituents? Absolutely. Do I feel like the Tea Partiers have an obligation to roll over for the obama agenda? Absolutely not. They have demonstrated an ability to work with obama on areas of common ground – the sequester, trade, etc. I suspect there are other areas – ending the Cadillac Tax in obamacare for example. There could be common ground on things like corporate tax reform, but I suspect the GOP figures that it will be easier to negotiate with a Republican, or even Hillary than it will be with obama. So for them it makes sense to defer these priorities till post-2016. The hot-button priorities for the left are gun control, immigration, inequality, and raising the minimum wage. Face it, none of those issues are remotely important to GOP voters. In fact, the right doesn’t consider these things problems to be solved in the first place. The shoe will be on the other foot at some point, and GOP priorities of flattening the tax code and regulatory reform aren’t going to resonate with the John Conyers and the Raul Grijalvas of the House either. And referring to Planned Parenthood, I was lumping myself in with conservatives in general, although some of their platform doesn’t appeal to me. I am fundamentally a Libertarian – I don’t get animated over abortion or gay marriage, I want to see pot legalized, I want to see our military disengage from the Middle East etc. etc. But Republicans overall more represent my political opinions than Democrats do. Still, as a libertarian, I would imagine you would object to government funding of abortion. but we don’t really want confiscation… trust us! Because the rest of us, we don’t want your guns. But we’ll eventually take away your right to keep them, if you leave us no other choice. Don’t just sit there typing, get out and run for office. In the president's view, Tea Party Republicans would rather burn down the House than admit the democratic process "requires compromise." @Scott, yes, but this is not an issue I would go to the barricades for.. Question for you: Do you believe that PP would be forced out of business if it stopped selling abortion services? I’m not sure what that would look like. In the mall, all the eye glass shops have ‘independent’ doctors of optometry. I can see Planned Parenthood offices colocated with ‘independent’ abortion providers. That is, do you think the money it gets from abortion subsidizes whatever else it does? It’s definitely not the other way around. Most opponents argue that all funding must be cut for Planned Parenthood because the federal money is somehow subsidizing the abortions. Even if both sets of services were completely financially self-supporting from an accounting perspective there is a certain synergy and economy of scale of having full-services under one roof. Do not forget that for some True Believers, it’s not just abortion they oppose but all forms of contraception. The attacks on abortion providers are concurrent with regulations on Plan B ‘morning after’ pills, IUDs, and even oral contraceptives as being forms of abortifacients. I’m not sure what that would look like. You live in Maryland, right? Check out any Community Health Center in Maryland and you should be able to see what providing for women’s health care without selling abortions “looks like”. It’s definitely not the other way around. If that is true, then there is no reason for abortion advocates to worry about defunding Planned Parenthood of federal funds, as that would not impact PP’s ability to provide abortions. BTW, the nonsense about PP being the “largest provider of women’s health care” is true only if by “women’s health care” one actually means “abortion” (which of course is exactly what most abortion advocates do in fact mean). If one means non-abortion related health care, then community health centers provide far more health care than PP. Do not forget that for some True Believers, it’s not just abortion they oppose but all forms of contraception. How could we forget it. This is the go-to red-herring that abortion True Believers always bring up in order to avoid having to address the abortion issue. But of course the effort to defund PP would have no viable political support to speak of if PP simply provided contraceptives and didn’t do abortions. It is a sight to behold, though, watching True Believers try to talk about anything (women’s health!, contraception!) but the actual issue that is causing the controversy, ie abortion.